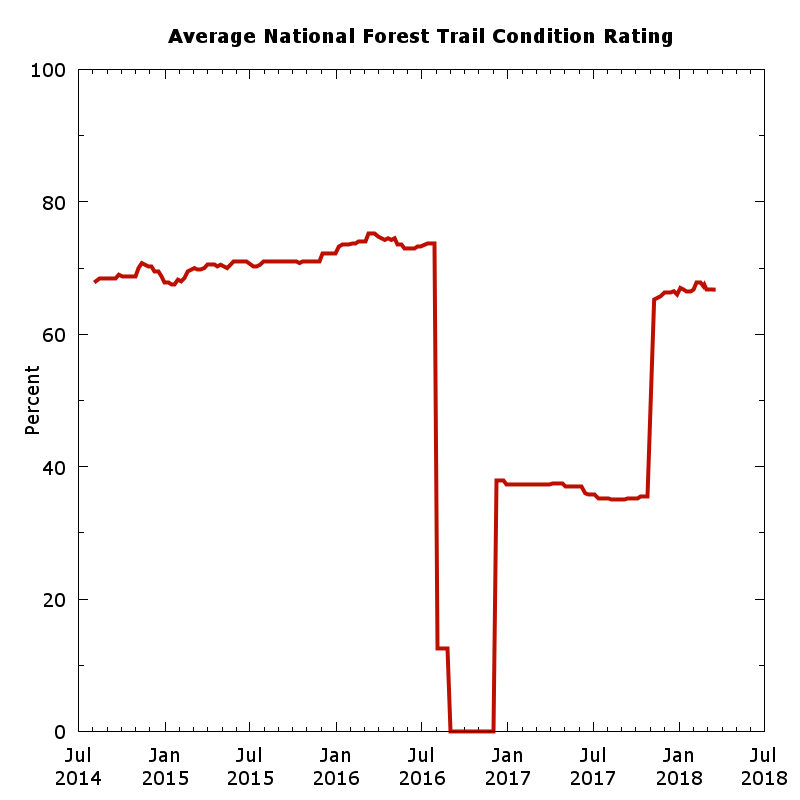 Nature is relentlessly degrading the National Forest trails in Big Sur. 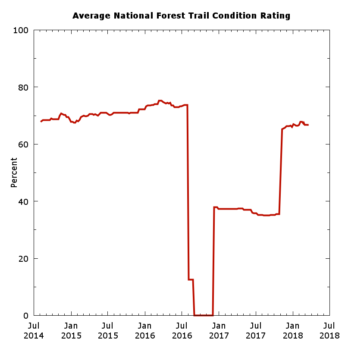 And the US Forest Service no longer maintains them. So volunteer trailcrews have been pushing back – lopping, sawing, and doing treadwork to keep the trails passable. But are they rebuilding the trails as fast as nature is destroying them?? – the summit is narrow, so gives a 360° panorama from a 4936 ft elevation. I was ignorant – I called them Cypress trees. Actually, I knew they didn’t quite look like Cypress – but their wind-blown shaping was akin to what I’ve seen in Cypress and I didn’t know what else they might be. Surely not Redwoods, those magnificently tall trees we here on the Central Coast know so well – these trees were only 15-20 ft high. I went out to see what the current Molera State Park looks like. 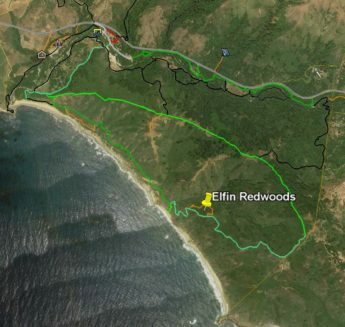 Only the Post Summit ridgeline was burnt by the 2016 Soberanes fire – but the following winter’s heavy rainfall events caused the Big Sur River to overflow and flood lower sections of the park, notably its parking lot and campground. The park was closed for a long time, then re-opened this summer but with many trails closed. Currently only the Bluffs, Bobcat, Creamery Meadows, Panorama, Ridge, and Spring Trails are open. Waking at 3:15AM is not my ideal way of starting a day – but today lack of daylight was not going to keep me from reaching Rattlesnake Camp. Last time I’d had to abort my attempt due to running out of daylight and energy. 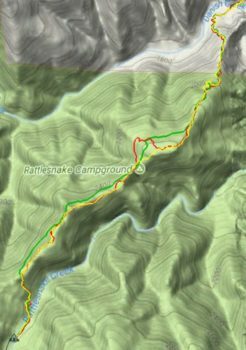 This time I would start earlier and would avoid the difficulty of trying to follow Rattlesnake Creek Trail – instead, it would be a bushwhack. Sadly, the lower half of Rattlesnake Creek Trail, below Rattlesnake Camp, is now impassable. This venerable trail was one of the oldest in the Ventana wilderness, having appeared on a 1921 quadrangle when few Ventana trails existed. 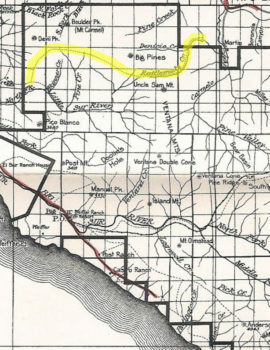 My “Finding the Carrizo Trail” post glossed over the fact that the western end of the Carrizo Trail of that time (2009) differed significantly from the current (2017) route. 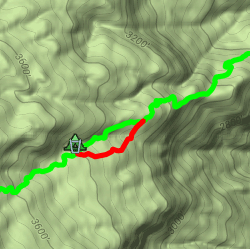 In my “Maps can lie” post, describing my mapping of that end, I had followed the route described in VWA Trail Reports: leave the North Coast Ridge Trail at a flag marking a ridge. At the time I’d noted the initial section was rough and sketchy, tread only becoming evident after leaving the ridge. I was later enlightened by Paul Danielson as we were hiking along the North Coast Ridge Trail – shortly after the Gamboa Trail junction, 0.6 miles before the ridge, he pointed out a spot where the “historic” Carrizo Trail junction had been. That route had become overgrown and abandoned, so hikers were instead taking a shortcut along an old dozer cut along the ridge. In July of 2010, trailworker par excellence Robert Parks took it upon himself to restore that overgrown “historic” section. Over six worktrips, he and some helpers (including Paul Danielson) hacked and sawed their way through that brush. 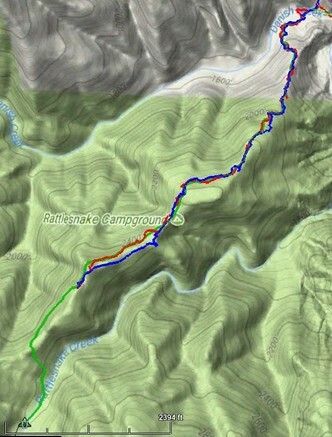 Much of the tread was still intact, so following the route itself was not too difficult. In October the final section was completed and a celebration held. 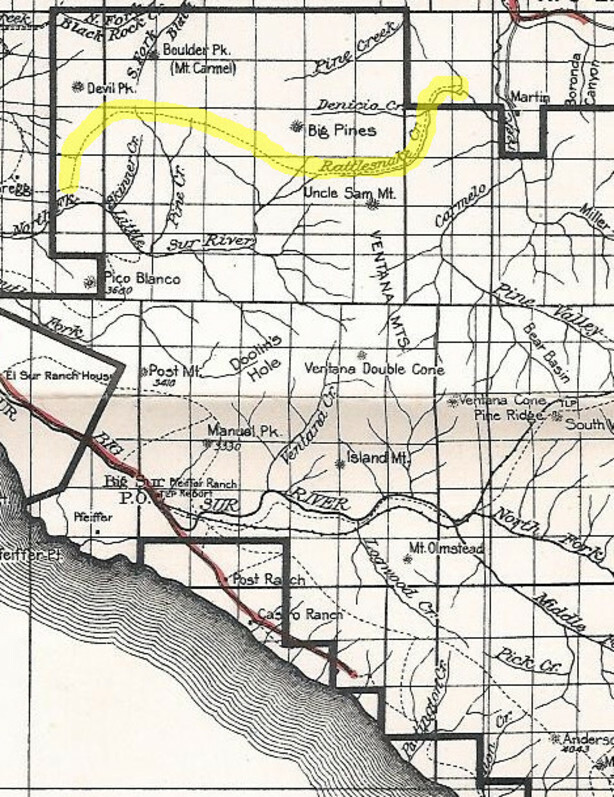 The Carrizo Trail is a historic route, used in the 1800’s by homesteaders driving their cattle and hogs to market in Jolon. After the construction of coastal highway it fell out of use but was later re-created by Steve Chambers and other VWA trailworkers, to connect the coastal ridge to the San Antonio River. But where exactly does it go? And where is the USFS “Carrizo Spring Camp” which lies along it? Hearing that a section of the Carrizo Trail below Carrizo Spring Camp has recently been re-routed (see map), I went out to see what the new section looks like and GPS the new route. I found the trail has been moved out of the paralleling gully, into a drier environment. It should be subject to less overgrowth and easier to maintain – a definite improvement. While I was out there, I decided to reprise my first Carrizo Trail mapping hike. That 2009 hike was motivated by wanting to find exactly where the trail went, since I’d found different routings on different maps. This hike would be more leisurely, for there has been significant trailwork along the entire trail since them. Back then there was much crawling in brush tunnels and much searching to find the trail – this time I only had to search once and never had to crawl! So I had more opportunity to look around and appreciate the trail and this hike and it was much more enjoyable. 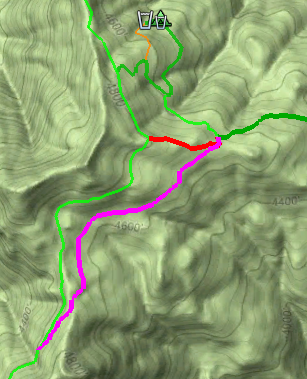 I‘ve been asked how/why I began to GPS the Ventana/SilverPeak trails. I’ve told this story to some in brief – here is the whole story.